In a craniotomy, a bone flap (a piece of the skull) is removed in order to allow the brain surgeon to reach the brain. In essence, the bone flap is an access panel to get to the brain. The other benefit to a craniotomy is that it takes the pressure cooker lid off of the brain. When the neurosurgeon does not return this bone flap after surgery, the procedure is then called a craniectomy. The reason a craniectomy would be performed would be to allow the brain more time for the swelling to go down. Often it is months before the bone flap will be replaced after a craniectomy. The bone flap is stored in a freezer until the brain has sufficiently recovered. Then a second brain surgery is performed to reinsert the bone flap to the skull. If for some reason the bone flap cannot be returned to its original place in the skull, an artificial plate may be used to do the reconstruction. A complication of a craniotomy or craniectomy is that there may be a less than perfect fusion of bone flap or plate the skull after the second surgery. In such cases, there may be defects in the skull. 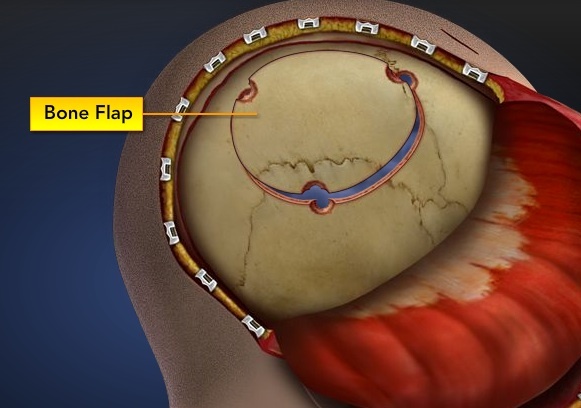 How big the bone flap will be depends on the type of surgery. In the second surgery, the bone flap is then reaffixed to the skull using titanium plates and screws. A surgery as radical as a craniotomy or craniectomy can involve complications. The cerebral cortex will receive some insult from the surgery, which may cause seizures. Thus, anti-seizure medicine may be prescribed as a preventative measure for seven days. Bacterial meningitis can also be a complication. Pain may be a factor in craniotomy patients which can be managed through the use of scalp infiltrations, nerve scalp blocks, and morphine. In the case of a craniectomy, the brain is obviously quite vulnerable before the bone flap is replaced in the second surgery. Thus, it is common for brain injury survivors who have had this procedure, to wear a helmet between the surgeries.